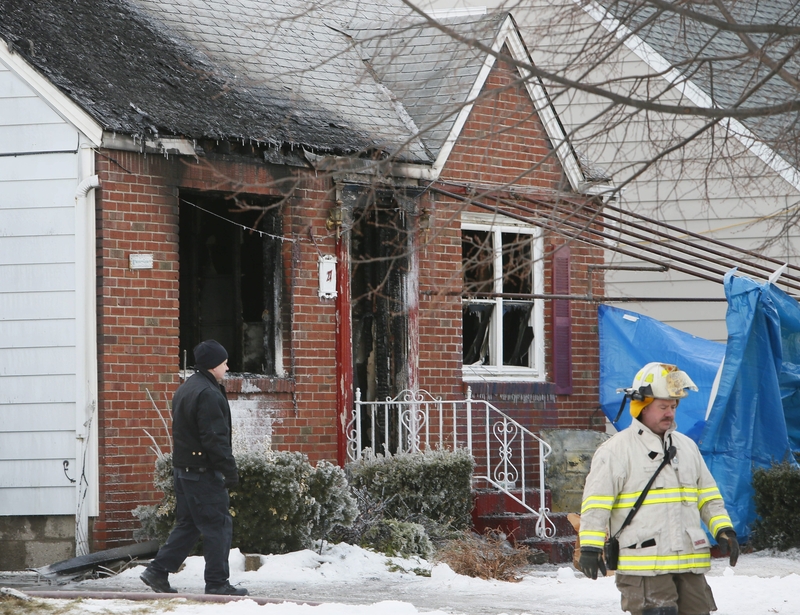 Police and firefighters investigate at the scene of a fatal house fire Tuesday on Furlong Road in Cheektowaga. Authorities expect that dental records will be able to confirm the identities of a couple who died Tuesday in a predawn house fire in Cheektowaga’s Cleveland Hill neighborhood. An autopsy is scheduled today. The fire, reported at 4:22 a.m., is believed to have started on the first floor of the 1½-story Cape home at 27 Furlong Road, a block-long street near Kensington Avenue and Century Road. Police officials said the floor caved in, making it difficult for firefighters to enter the house and find the occupants. She said another neighbor tried breaking windows to rescue the people inside. Police Lt. Ken Rusin said one victim was found in the front of the house and the other in a back room. Both were on the first floor. Rusin said the house was heavily damaged by the fire and unstable structural conditions slowed the work of fire investigators. The structure smoldered for hours afterward. Outdoor temperatures in the teens created additional hazards. A portable pump was placed next to the home to draw water out of the basement. Water flowed down a neighboring driveway and into a storm sewer that had been cleared of compacted snow. But icy conditions developed on the driveway, sidewalk and nearby street. Town crews responded to spread salt in the area. Before the bodies of the victims were removed, tarps were attached to a metal awning frame in front of the house, shielding the front door and windows.